Big Ollie -The Silly Golden: Allergies? After taking Ollie in to get his sutures removed, I explained to the vet that when I take his collar off, he goes straight for his front paws. He'll gnaw an bite that them like he's trying to get at this one itch. I had strong concerns because his paws would end up red and tender. The Vet concluded that it would most likely be a sort of skim allergen that is caused by the food he is eating. ALLERGIES?! Goodness sakes?! I guess since we are both mammals, it's most likely that we (dogs and humans) can develop allergic reactions. So to help with finding out the allergen, the vet put Ollie on a hypoallergenic diet. Which means he is to stop feeding on anything thing we used to give him. Completely eliminating that. 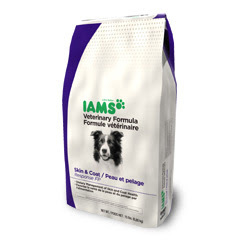 And start him on this Iams, hypoallergenic dog food for skin and coat. As for treats? Carrot sticks. Yup. Along with having to buy fresh organic carrots, this dog food is NOT cheap. Keep in mind, Ollie eats about 4 cups a day of dry food. So we go through a 15 lb bag pretty fast. At $50 bucks a bag, the dollar bills are adding up. OOOOOOF! 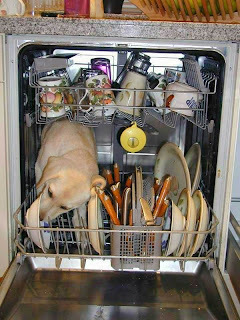 I knew that getting a dog would cost us money, but this dog is eating better than I am! ohh.. left out something.. it is once a week when the dogs sneezes a lot, so it's not very often.